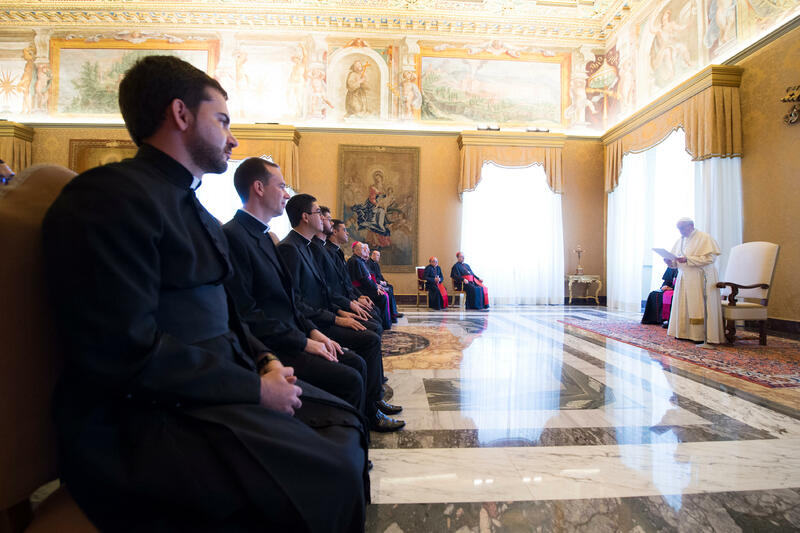 His remarks came in the Consistory Hall of the Apostolic Palace, when he received the Community of the Pontifical Pio Brazilian College, Rome, for the 300th anniversary of the rediscovery of the venerated Image of Our Lady of Aparecida. I welcome you today, three hundred years after the rediscovery of the venerated Image of Our Lady of Aparecida. I thank Cardinal Sérgio da Rocha for the words he addressed to me on behalf of all the priestly community of the Pontifical Pio Brazilian College, as well as the women religious and employees who collaborate in making this house “a little piece of Brazil in Rome”. How important it is to feel that you are in a welcoming environment, every whenever we find ourselves far from our homeland and gripped by nostalgia (saudades)! An environment of this type helps also in overcoming the difficulties of adapting to a situation in which pastoral activity is not the center of the day. You are no longer parish priests or parish vicars, but student priests. And this new condition carries the danger of generating an imbalance among the four pillars that support the life of a priest: the spiritual dimension, the academic dimension, the human dimension and the pastoral dimension. Naturally, in this particular period of your life, the academic dimension prevails. However this does not imply neglect of the other dimensions. It is necessary to care for your spiritual life: Mass every day, daily prayer, the lectio divina, the personal encounter with the Lord, the recital of the Rosary. The pastoral dimension too must be cared for: where possible, it is healthy and advisable to carry out some form of apostolic activity. And with regard to the human dimension, it is necessary above all to avoid, when faced with a certain emptiness generated by solitude – because now you enjoy the consolation of the People of God less than when you were in your diocese – losing the ecclesial and missionary perspective of your studies. Neglect of these dimensions opens the door to several “diseases” that can assail the student priest, such as “academicism” and the temptation to turn studies simply into a means of personal affirmation. In both cases on ends up suffocating the faith which must instead be safeguarded, as Saint Paul asked Timothy: “Guard the deposit entrusted to you. Avoid the irreverent babble and contradictions of what is falsely called ‘knowledge’, for by professing it some have swerved from the faith” (1 Tm 6: 20-21). Do not forget, please, that before being teachers and doctors, you are and must remain priests, pastors of the people of God! But how is it possible then to maintain balance between these four fundamental pillars of priestly life? I would say that the most effective remedy against the risk of imbalance is priestly fraternity. This was not written, but it comes to me to say it now, because Paul [in the passage cited above] spoke about gossip: what most destroys priestly fraternity is gossip. Gossip is a “terrorist act”, because with gossip you throw a bomb, you destroy the other, and walk away calmly! Therefore, it is necessary to safeguard priestly fraternity. Please, no gossip. It would be good to put a sign at the doorway: “No gossip”. Here [in the Apostolic Palace], there is the image of Our Lady of Silence, at the first floor lift; Our Lady who says, “No gossip”. This is the message for the Curia. Do something similar for yourselves. Indeed, the new Ratio Fundamentalis for priestly formation, in facing the theme of permanent formation, affirms that “Priestly fraternity is the first setting in which ongoing formation takes place” (no. 82). This is therefore in a certain way the cornerstone of ongoing formation. And this is based on the fact that, through priestly ordination, we participate in the sole priesthood of Christ and form a true family. The grace of the sacrament assumes and elevates our human, psychological and emotional relations, and “grows ever greater and finds expression in the most varied forms of mutual assistance, spiritual and material as well” (Saint John Paul II, Post-Synodal Apostolic Exhortation Pastores dabo vobis, 74). In practice, this means knowing that the first objective of our pastoral charity must be our brother in the priesthood, the first neighbor we have – “Bear one another’s burdens”, the Apostle urges us, “and so fulfil the law of Christ” (Gal 6: 2). Pray together, share the joys and challenges of academic life; celebrate, drink a cachacinha… all this is good, it is good to help those who suffer most from the nostalgia; go out together for a walk; live like a family, like brothers, without excluding anyone, including those who are in crisis or perhaps have had lamentable attitudes, because “priestly fraternity excludes no-one” (Pastores dabo vobis, 74). Dear priests, the people of God love to see and need to see that their priests care for each other and live as a family; and this is even more true when considering Brazil and the challenges, both religious and social, that await you upon your return. Indeed, in this difficult moment in her national history, when many people seem to have lost hope in a better future due to enormous social problems and scandalous corruption, Brazil needs her priests to be a sign of hope. Brazilians need to see a united, fraternal and integral clergy, in which priests find themselves facing obstacles together, without giving in to the temptation of attention-seeking and careerism. Beware of this! I am sure that Brazil will overcome her crisis and I trust that you will be protagonists in this. To this end, always count on a special help: the help of our Mother in Heaven, whom you Brazilians call Our Lady of Aparecida. The beautiful words of a hymn with which you greet her come to mind: “Holy Virgin, beautiful Virgin; loving Mother, dear Mother; keep us, help us, O Our Lady of Aparecida” (“Virgem santa, Virgem bela; Mãe amável, mãe querida; Amparai-nos, socorrei-nos; Ó Senhora Aparecida”). May these words find confirmation in the life of each one of you. May the Virgin Mary, with her support and help, help you to live in priestly fraternity, ensuring that your period of studies in Rome produces abundant fruits, aside from your academic qualification. May the Queen of the Pio Brazilian College help make this community a school of fraternity, making every one of you leaven of unity within your respective dioceses, since the diocesanity of the secular priest feeds directly from the experience of fraternity among priests. To confirm these hopes, I heartily impart to the directorate, the students, the women religious and employees, to everyone, as well as your families, my Apostolic Blessing; and I ask you, please, not to forget to pray for me. Thank you!